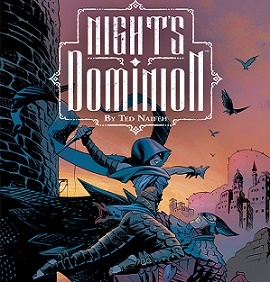 Nights Dominion is a new epic, fantasy saga that will be published by Oni Press from September. Ted Naifeh (Batman 66) has created this dark, medieval fantasy which sounds very much like a cool new addition to the genre. Fans who appreciated Rat Queens and Skullkickers should definitely ensure they trek down to the local comic book store and check this out. Naifeh is also the creator of the Eisner nominated series Courtney Crumrin. The ancient city of Umbar has at its center the tower of Uhlume, the home of kings and untold riches. For the rest of Umbar’s population however the circumstances are very different, the people live in grim poverty. Five inhabitants of the city are hatching an ambitious plan to negate the towers defenses and steal the hidden treasures for themselves. Our would-be vault robbers are the Bard, the Acolyte, the Asp, the Magus and a Barmaid. But, Emarane is no normal Barmaid, she is also a powerful night and wanted criminal.